Bill Henderson was born in 1947 in Dallas, Texas, and was raised in Milwaukee, Wisconsin. He enlisted in the U.S. Air Force Reserve on April 23, 1969, and entered Officer Training School at Lackland AFB, Texas, on July 3, 1969. 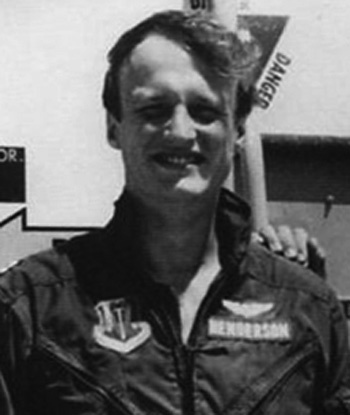 Henderson was commissioned a 2nd Lt on September 29, 1969, and then attended Undergraduate Pilot Training at Vance AFB, Oklahoma, where he was awarded his pilot wings in December 1970. Lt Henderson first completed F-100 Super Sabre Combat Crew Training at Luke AFB, Arizona, and then went through OV-10 Bronco training before deploying to Southeast Asia in October 1971. He served with the 23rd Tactical Air Support Squadron at Nakhon Phanom Royal Thai AFB, Thailand, from October 1971 until he was forced to eject over South Vietnam during a rescue mission and was taken as a Prisoner of War on April 3, 1972. After spending 359 days in captivity, Capt Henderson was released during Operation Homecoming on March 27, 1973. He was briefly hospitalized to recover from his injuries at Wright Patterson AFB, Ohio, and he left active duty on December 18, 1973. Capt Henderson left the Air Force Reserve on April 22, 1975. 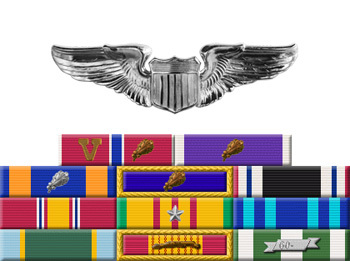 For the period July 1972 to March 1973: This officer distinguished himself by outstanding achievement in a position of leadership while detained as a Prisoner of War in North Vietnam during the above period. This officer performed duties dealing in highly classified material while under constant surveillance of the enemy. He generated new ideas and improvised new techniques which greatly enhanced covert operations. His outstanding performance and dedication to duty reflected great credit upon himself and the United States Air Force. 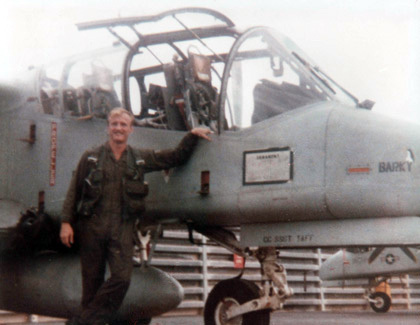 Lt Henderson with his OV-10 Bronco during the Vietnam War.